SHOULD cattle producers whose slaughter or even feeder animals producer higher carcase merit within a broader brand or category specification range be better rewarded for that performance? It’s a topic which has come up in a number of beef producer forums over the past six months, in both northern and southern Australia. The catalyst for such calls has been the emergence of beef supply chain brand programs which have started harvesting the better-performing carcases from within a production run, based on either marbling or MSA index, and selling them under a separate identity, at a price premium. Some producers clearly feel they should be better compensated for that. Up to now, most supply chains have simply provided a blanket price for all cattle fitting company and MSA specs for each program. Rangers Valley takes the marbling score 3 and 4 carcases from its 270-day grainfed Angus program (minimum marbling score 2) and packs them under its Black Onyx label; and the score 5’s and higher under its even more exclusive Black Market label. JBS Southern’s large-scale Great Southern grassfed program, killing around 3200 per week, has extended its brand to include the Pinnacle brand (marbling scores 2-3, MSA index +63) and the super-premium Little Joe brand (marbling score 4 and up, MSA index +65). 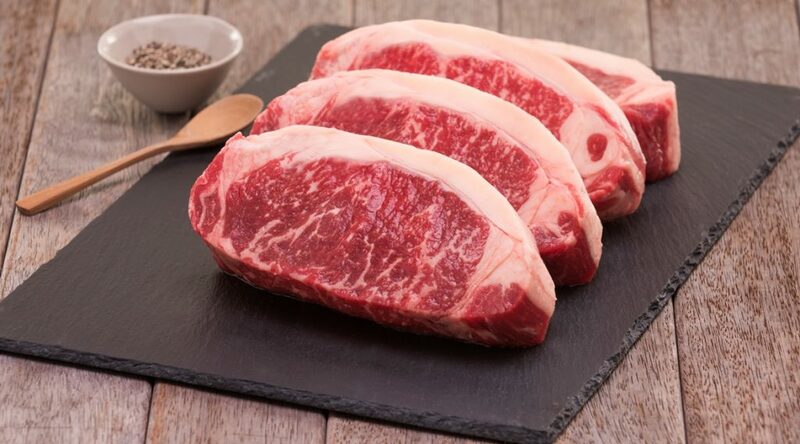 The company this month announced a 20c/kg premium (see earlier story) for the high performers at the upper end of its Great Southern spec, producing marbling scores of 4 or better, and MSA index scores of 64+. Bindaree Beef in northern NSW has split its 0-4 tooth MSA price grid into two categories, above and below an MSA index score of 61, with a 5c differential in price between the two, for separate brand programs. HW Greenham & Sons is segmenting cattle for its Bass Strait grassfed program being produced out of Moe, and has already started pricing based on three MSA index levels (see today’s separate story). When asked about prospects for payments for better-performing cattle within brand programs, a common view among branded beef supply chain managers is that there is already some considerable ‘defacto’ price recognition of better cattle – if only on a mob basis, rather than on individual carcases. M3 (Brahman or Brahman cross, based on hump height (typically 10c below M2). Secondly, they argue that historical performance of suppliers’ cattle to a set of brand program specs also creates ‘premiums’ for the better carcase performers. Some processors sort their regular brand program and even commodity cattle suppliers into three, four or five groups, based on performance history (commonly called a vendor selection index, mapping the performance of every cattle supplier’s cattle over 10-15 years, in some cases). Different payment opportunities apply to each, depending on supply and demand. Paying premiums purely on prior performance could carry its own problems, however, with one grainfed brand manager saying that inconsistency in marbling performance from one consignment to another from an individual suppliers could be challenging. This ‘prior history’ based pricing structure could ultimately be replaced by moves into true Value-Based Marketing programs, which are getting closer to reality. Thirdly, processors claim a ‘percentage of better performers’ is already factored into the generic grid price for all spot cattle purchases, especially among grainfeds. The same applies in feeder cattle pricing, they suggest. How many 100-day cattle are ‘better performers’? Under current 100-day grainfed slaughter cattle grids across Australia (generic programs, not connected with brands), Beef Central could find no evidence of grid price recognition for better marbling performance. However it is well known that a percentage of carcases from cattle shortfed for 100-days do produce ‘commercially significant’ levels of marbling. In response to that, JBS, for example, recently launched its Yardstick brand program, selecting marbling score 2 and higher cattle from 100-day cattle fed at the company’s Beef City feedlot near Toowoomba (see Beef Central’s recent story). Beef City processes around 3000 100-day cattle each week, and JBS said there was a growing proportion of cattle fed for 100-day programs now producing higher marbling performance. As the cattle fed at Beef City are all bought as feeders, there is no attempt, at this stage, to reward the better marbling performers, but as discussed below, large grainfed supply chains are telling Beef Central that that may change, at some future time. How common are the higher marbling performers? Brisbane Show’s 100-day performance competition fed at Mort & Co’s Grassdale feedlot provides some useful guidance about the extent of higher marbling and MSA index performance in 100-day cattle. This year’s competition attracted 343 entries in pens of seven, covering a broad spectrum of breed types from Brahman crosses, tropically-infused composites, Euro crosses through to straight Angus and Shorthorns and their crosses. Of 332 carcases receiving an MSA score this year (11 were disqualified for a range of reasons, including starting and finishing weights outside the competition’s acceptable range), 35 (10.5pc) received a marbling score of 2 or better. Score 2s or better were found spread across a variety of breed types, and included some pens with no British content whatsoever. At the upper end of the spectrum, two mobs of Speckle Park x Angus steers produced 11 of 14 carcases with marbling scores of 2 or 3 – yet under current grid structures they receive no direct reward for that result. One of the challenges raised by a processor spoken to for this report was that when buying 100-day cattle from independent lotfeeders for more ‘generic’ 100-day beef programs (not aligned with company-fed brands) it was impossible to forecast how many of those ‘better performers’ would present in the chillers each week, or even from season to season. That made it much harder to build a ‘premium marbling’ incentive into pricing, where most large brand customers justifiably expected a consistent supply of product, week-in, week out. “It would be very challenging to build a brand program and ask a premium price for the meat, when there might be shortfalls in production of that better marbling score or MSA index beef from one week to the next,” the processor said. What happens in the future? Could processor payment systems rewarding higher individual carcase performance within a category or brand specification be extended to include feeder cattle, as well as slaughter animals in future? A common view among processors spoken to for this report was that it was indeed possible, perhaps within the next two to five years. Technology was one of the drivers that could make that happen, through better and more efficient data capture and data sharing, linking NLIS with chiller performance and boning room performance on an individual animal basis. One of the challenges raised in trying to apply this principle to feeder cattle was the time that elapses between purchase and slaughter. A feeder steer purchased for Oakey Beef’s Angus Reserve 150-day program, for example, may take seven months from purchase for backgrounding to slaughter. For Rangers Valley’s longfed Angus program, that period can be as long as 11 months. “We’d never say never, about such payments in future, but its more challenging with feeders,” a major multi-site export processor told Beef Central during discussion about this report. “We’re getting a lot more information back on carcase merit now, on an individual animal basis, and with the information flow that’s now happening through technology across the industry, one day systems may allow that to happen,” he said. Another large Queensland-based export processor said the arrival of easy-to-understand and use MSA index scores had provide an opportunity for more processors to segment current brands into higher and lower quality categories, and perhaps pay more for the higher performers. He suggested the incentive could be driven in some segments by MSA index, while others might align with marbling score – and in some cases, a combination of both. Over time, however, there was a risk that producers whose cattle were not achieving the higher quality targets might get more heavily discounted than they currently are, as ‘commodity’ beef. “The producers whose cattle are stuck at the left-hand end of the bell curve will get ‘realised’ more quickly than they are now,” he said. Another multi-state export processor livestock manager said he had already done some ‘back of the envelope’ sums on how such a performance-based ‘retrospective’ payment model on better performing feeder cattle might work. He foresees a time when all feeders get a base standard price at feedlot entry (perhaps even eliminating the breed factor used currently as a defacto for marbling/quality), and the vendor then receiving a second cheque – months later, after the cattle have been fed and slaughtered – for any animals performing above a certain marbling or MSA index level. “I dislike using the word, ‘premium’, but such incentives for individual animal performance would really help drive the progression of genetic improvement for meat quality going forward,” he said. A retrospective performance payment could also help overcome the problem of inconsistent performance in non vendor-bred (trader) feeder cattle, he suggested. He pointed to rapid progress being made in meat quality in the US grainfed industry, where record volumes of USDA Prime grade carcases (roughly equivalent to AusMeat marbling score 3 and better) are now being produced (see tomorrow’s monthly column from US meat and livestock industry analyst, Steve Kay). Inevitable shortages of feeder and slaughter cattle supply in the next two years, caused by herd liquidation after drought, could be a catalyst to progress such changes more quickly, the contact said. So what will happen in a few years when the wheel turns and some fat health scare is published and consumers want lean meat with minimal marbling? Perhaps a section of the beef industry needs to market lean “healthy” beef to get premiums there. Perhaps this could be for the more northern producers. Marble score is proportionally factored into the MSA index based on many years of scientific research. Thats the science. To factor in marble score ‘a second time’ and suggest that will achieve a more accurate reflection of carcase value is nonsense! Why bastardise eating quality outcomes and breeding direction by double dipping with marble score? Well said David Hill!!! Can’t believe the investment that our industry has put into MSA to then just throw it all away for a marble score. Anyone ask which rib they were going to grade at – the variation in that alone is significant. One of the primary drivers of MSA was that each individual cut performed differently, particularly when it comes to marble score. Describing a carcass as MB 2+, MB 3,4 or whatever when that measurement is made at just one incision is a poor offering of description to our ultimate consumers when we have so many other tools at hand. Grids need to be rebuilt to allow the passage of time as our cattle move through the slaughter and boning process. There should be shared ownership of the animal, carcass and offals and by-products so payment can reflect the value of the work provided by the producer is rearing and finishing his cattle. There will be a downside for those turning off stock for lower value markets but this will reward performance. Grids need to be three dimensional to fully compensate the party carrying the greater risk through the supply chain. One would wonder why the Australian beef industry continues to pour producer levies into MSA R&D, it seems the US had it right all along, marbling being the principal indicator of eating quality and all! You never hear much about maturity score or the fact that as I am informed that a lot of US carcasses have a 48 hour chill prior to grading, this could ultimately effect the visual marbling as well as pHu decline possibly. It is probably about time producers started asking questions around chill cycles and the amount of electrical stimulation used in many cases in this country, another would be what are the optimum bloom times for different classes of carcases, even some clarity of how loin temperatures at grading may effect grading outcomes? I am sure as an industry we are on top of it, considering we will continue to include certain breeds to the premium signal back to producers, this along with the usual objective chestnuts of dentition and meat colour, are sure to give us producers a clear indication of where we should be heading, and here was stupid me trying to reduce ossification along with improving marbling as a way to improve the MSA index potential of the stock we produce, whilst also considering the outcome as usual will ultimately depend on nutrition. The rapid pace of price signally in this industry continues to fill me with a great deal of faith, I may well go out and buy some bricks to build a chimney for Santa Claus. These opinions are my own, and not necessarily those of any organisation I may represent. Thank you Jon, for bringing this issue right out into the open. As long as there are differences in the carcass values of steers there will be reasons for buyers to pay to get ownership of those carcases. As you show these differences do exist. In the last two years The Angus Society has shown the wide variation in value of long fed steers bred as part of the Angus Sire Benchmark Program. Results are publicly available in the Angus Bulletin. Our emphasis is on putting marbling in to improve the MSA indices. We hope premiums for quality come quickly. The genetic route of using a high marbling bull is the quick fix. The real fix is to have a cow herd which also has marbling built into it. I cannot guarantee that my clients will get a premium for carcasses that marble in the immediate future. I think I can guarantee that they will not get premiums for carcasses that do not marble. EBV information on marbling is usually available when bulls are being bought – it should be used.